Winnipeg Canada police arrest 55 drunk drivers since December 3rd. Barbados police arrest…? Traffic Division Inspector Blades: How many drunk drivers did Barbados Police fail to stop? With about double the population of Barbados, the city of Winnipeg, Canada makes for an interesting comparison when it comes to arresting drunk drivers. Since December 3rd, the Winnipeg Police have stopped 1,422 vehicles in their annual month-long Christmas crackdown on drinking and driving. So far they have arrested 55 drunk drivers, of which 51 were male. The average age is 34 years old. 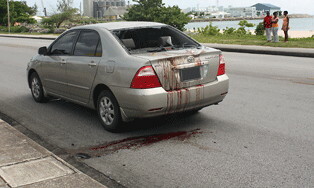 On Sunday afternoon, Errol Briggs walked across Spring Garden Highway from the beach and was struck by a vehicle driven by Preston Parris. Mr. Briggs was taken to the Queen Elizabeth Hospital but was found to be dead upon arrival. Thanks to successive BLP and DLP governments’ neglect of road safety and their failure to implement breathalyzer laws and equipment, Awadh Narayn Inder was fined only $750 for a hit and run accident on Christmas Eve. Oh… it’s Inder’s second offense. The arresting police officer stated that Inder was “under the influence” but unfortunately, you know how it is in Barbados. 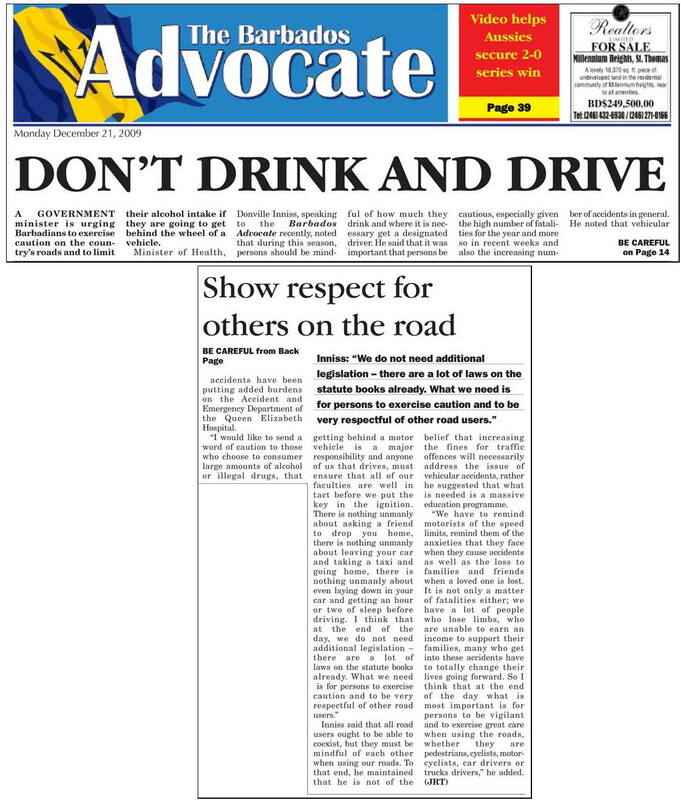 Unless a driver is falling down drunk the police have no recourse because unlike other countries that implement anti-drinking driving measures, in Barbados it’s okay to drink and drive if you can still stand up. The judge warned Inder to “stop drinking and driving” – a hollow threat if ever we’ve heard one. Not that Inder cares: this is the second time he’s been caught. In some places in the USA, Britain or Canada he’d be in jail, his car would be sold at auction and he’d be prohibited from driving for three years or more. In Barbados with no effective laws and our cultural acceptance of drinking and driving, Mr. Inder and folks like him are barely inconvenienced by getting drunk, running into someone and driving away and hiding. Even when caught the second time the penalty is nothing to be frightened of, so pass the bottle and to hell with the police and the courts. AFTER Awadh Narayn Inder hit a car on Tweedside Road, St Michael, on Christmas Eve he did not stop to inspect the damage, exchange numbers with the other driver, or call the police. Instead, the 33-year-old labourer, of Sobers Lane, St Michael, bolted from the scene and got as far as the Belle Estate, where he parked the car in a dark spot trying to elude the driver who pursued him. Appearing before Acting Magistrate Laurie-Ann Smith-Bovell in the Bridgetown Traffic Court yesterday, Inder admitted that he unlawfully drove vehicle X8322 on Tweedside Road without due care and attention. 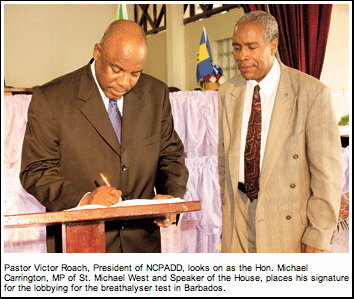 Minister of Health Inniss comments on Barbados Free Press? As our readers can see, a person claiming to be Minister of Health Donville Inniss commented upon this article. BFP’s editors changed the name on the comment from “Donville Inniss” to “Is this Donville Inniss?” until we are sure of the author. BFP has asked for confirmation via an email sent from the Minister’s official office. Although we have yet to receive a confirming email, there are other indications that the comment might indeed be from Minister Inniss. If and when we receive confirmation, we’ll let our readers know. Until then, please take the comment with a grain of salt. I know Marcus just said we’d be happy and ignore government er, people, for Christmas time but for me that promise lasted about 5 minutes after picking up today’s Barbados Advocate. See page 14. Mr. Inniss: you are dead wrong.